Tomorrow, hundreds of San Franciscans are expected to kick off Bike to Work Day with rides throughout the city. 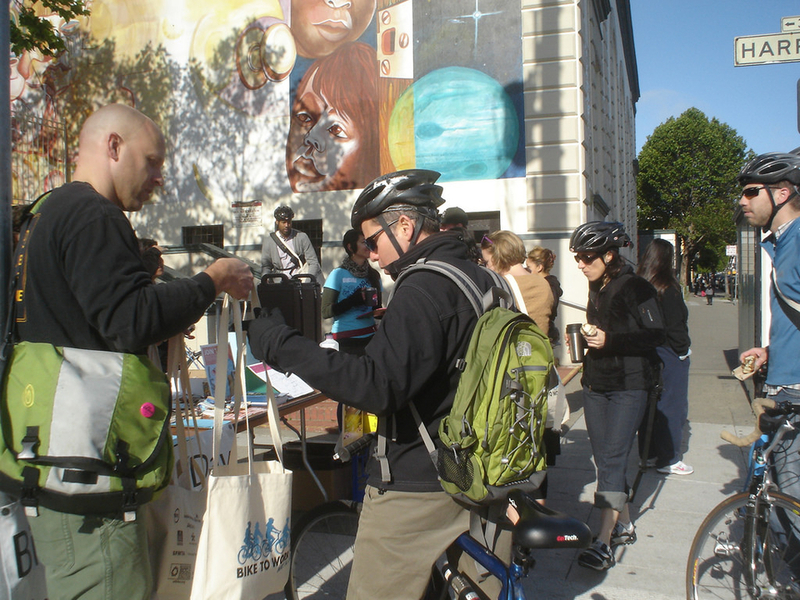 "Bike to Work Day is one of this incredible city's holidays where you really see who San Francisco is and where our values are," said San Francisco Bicycle Coalition spokesperson Chris Cassidy via email. "I love biking to work every day, but the energy on the streets on Bike to Work Day makes it a really special day to get out on two wheels." 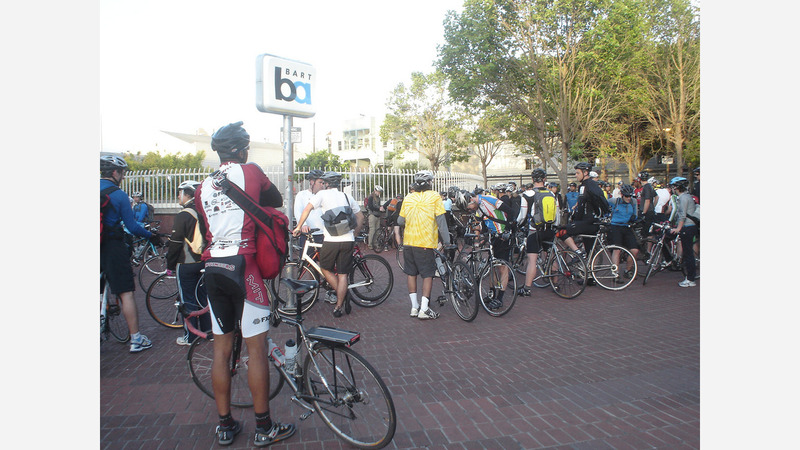 SF2G, a group ride down the Peninsula, will start at 5:45 a.m. at the 24th/Mission Street BART Station, "where folks are setting off for work down in Silicon Valley," said Cassidy. Cyclists will start rolling out around 6:30 a.m and head to their respective work places. According to the Coalition, riders of all skill levels are welcome to join. Participants will receive free beverages, snacks and a Bike to Work Day tote bag. Since 2005, SF2G has been organizing rides from San Francisco to the South Bay "in a way that's reasonably fast, safe, and fun, with rides happening every workday in almost all weather conditions," according to its website. At 7:30 a.m., rides will commence from all eleven supervisorial districts, culminating in a rally at City Hall. The program will include recognition of Bicycle-Friendly Business Award winners and bike-themed speeches by members of the Board of Supervisors, along with SF Bicycle Coalition Executive Director Brian Wiedenmeier. Bayview: Mendell Plaza, 1609 Oakdale Ave.
Ingleside: City College Multi-Use Building, 50 Phelan Ave.
Marina: Rapha Cycle Club, 2198 Filbert St. Outer Sunset: Nomad Cyclery, 2555 Irving St.
Richmond: Richmond Branch Library, 351 Ninth Ave.
SoMa: Sextant Coffee Roasters, 1415 Folsom St.
Western Addition: Ella Hill Hutch Community Center, 1050 McAllister St. Throughout the city, 26 energizer stations (PDF map) will be provided where member-volunteers will distribute free canvas tote bags, snacks and refreshments. Most stations will have staff from local bike shops to provide free, light maintenance as needed. All rides on Ford GoBikes in San Francisco, Oakland, Berkeley, Emeryville and San Jose will be free, including the recently released e-bikes. "We want the Bay Area to experience eco-friendly, fun rides on Ford GoBike this Bike to Work Day, and that's why we are providing free Access Passes to all on May 10," said Emily Stapleton, Ford GoBike General Manager in a statement. Ford GoBike riders can download and open the free app on Thursday to receive a free Access Pass, which normally runs $10 for the day. With the pass, riders will have access to unlimited 30-minute rides for a 24-hour period.